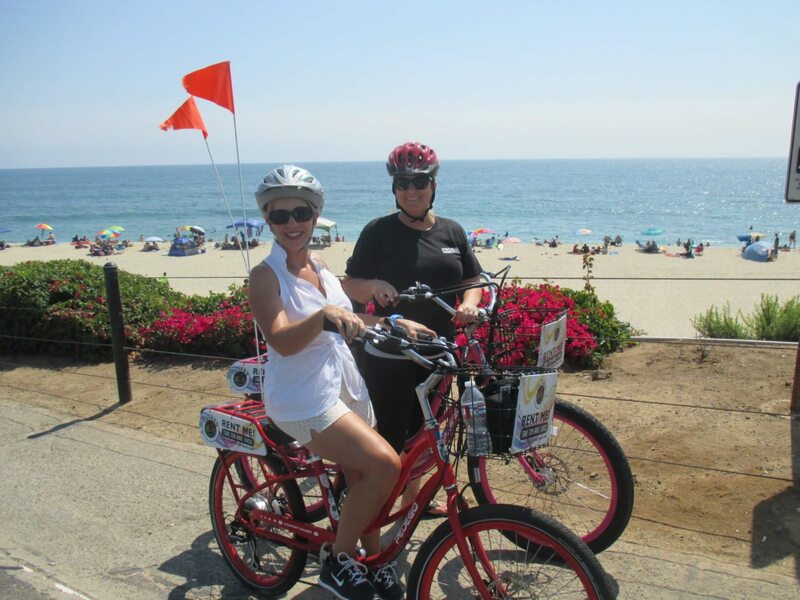 From Carlsbad To Encinitas….Pedaling Is A Breeze On An Electric Bike with Pedego of Carlsbad! 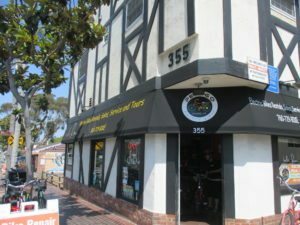 Along Carlsbad Village Drive, and just a stone’s throw from the ocean and Carlsbad Boulevard jaunting north and south, is the retail store, Pedego of Carlsbad. This is a friendly bike shop specializing in electric bikes. Riding electric makes it so easy to maneuver up and down hills, and ride much longer distances. 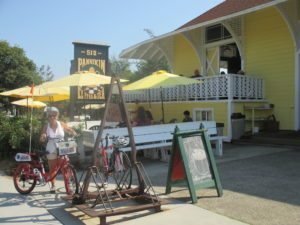 The showroom has many various models of Pedego electric bikes for sale, they service bikes on-site, have add-on accessories, do bike rentals, and they even do guided bike tours. On this fine summer day, we were treated to a great tour, guided by Denise who is one of the owners. Guided Tours Pedego Carlsbad offers four different guided tours. 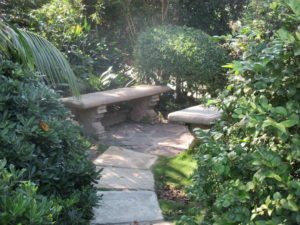 If 1-3 guests are riding as a group, they use head-sets to communicate points of interest along the way. 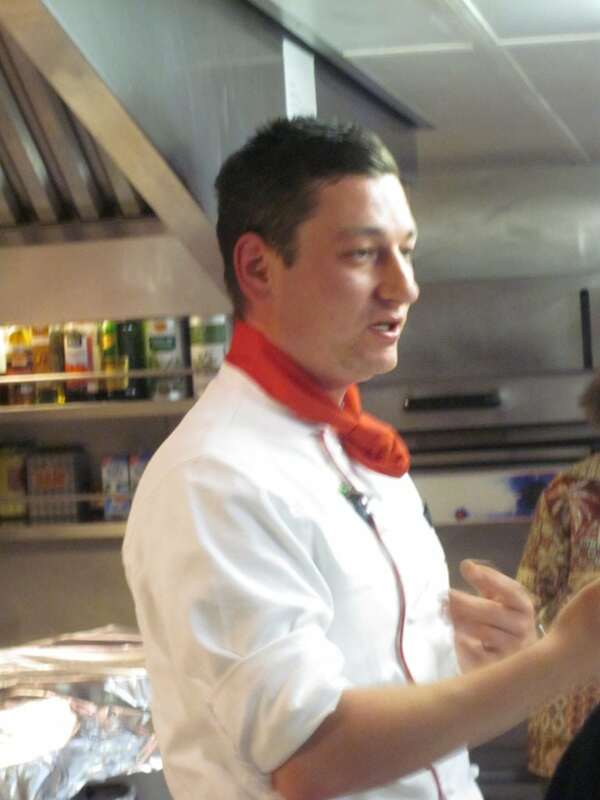 If there are more than three guests, the guide stops more frequently, however, do not use the head-sets. Step-By-Step “Dali Lama Tour” We decided to do the Dali Lama Tour since it would take us along the lovely coastline, through two charming towns just south of Carlsbad and along historic old Highway 101. We have never ridden along this stretch since we typically find ourselves cruising south by car on the 5 Freeway. This ride takes approximately 2.5 hours, or a tad more, depending on how many times you stop for photos and ice cream! 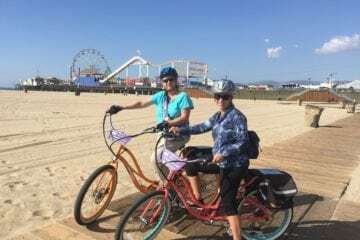 The cost of a guided tour is $79 per person, and includes the bike rental. 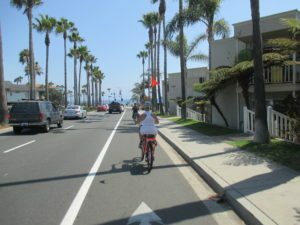 This overview and series of photos will give you the reader enough information that you could rent bikes, print this out, and conduct your own “self-guided tour” very easily. This is one of their most popular tours. 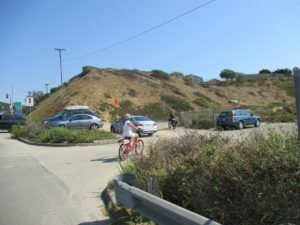 I might suggest that if you are new to using an electric bike, you might want to spend a few minutes in the back parking lot getting comfortable on the bike and learning how to use the throttle and brakes. It is easy but the nearby streets are busy, so it is best to be comfortable before heading out. We begin the tour making a left from the retail store and heading west on Carlsbad Village Drive just past a few buildings to reach Carlsbad Blvd. We cross the street and make a left turn. 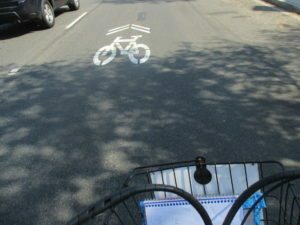 As riders head south, there is a designated bike lane to the right. There are automobiles to the left, and beautiful houses are to the right. 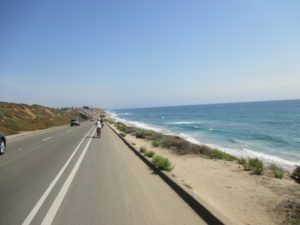 Very soon the roadway opens up to reveal the beautiful Carlsbad State Beach. Between Redwood Ave. and Tamarack Ave. is a wonderful Italian restaurant called Vigilucci’s Seafood & Steakhouse (on the left). 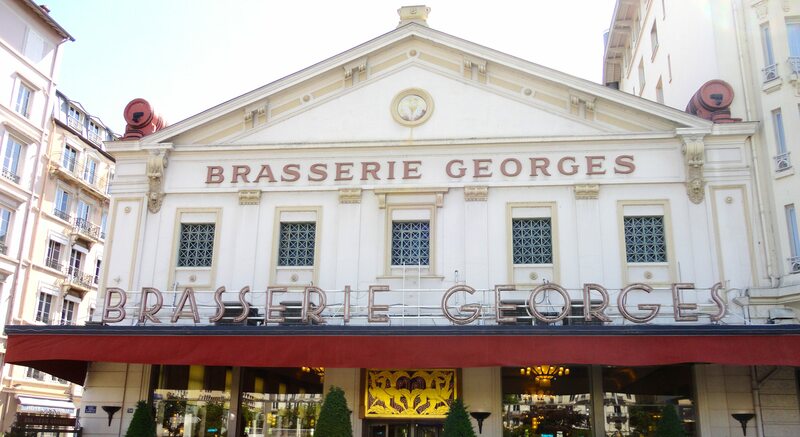 It is delicious and is open for lunch and dinner, with a lovely patio and a great happy hour too. Just past this spot, to the left you will see the Agua Hedionda Lagoon. An interesting footnote about this lagoon is… Carlsbad’s history began with the Luiseño people (the Spanish name given to them because of their proximity to Mission San Luis Rey). Nearly every reliable fresh water creek had at least one native village, including one called Palamai. 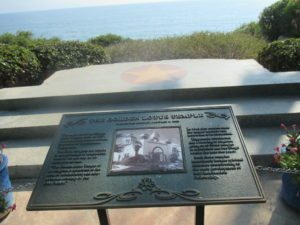 This site was located just south of today’s Agua Hedionda Lagoon (just north of Cannon Road). 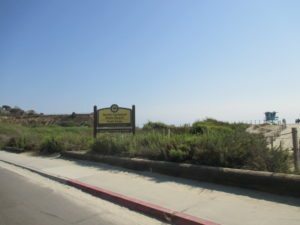 At Tamarack State Beach riders will see a large ramp that leads down to a parking lot and the beach is below. This is a lovely spot for a photo, and there are restrooms here as well. 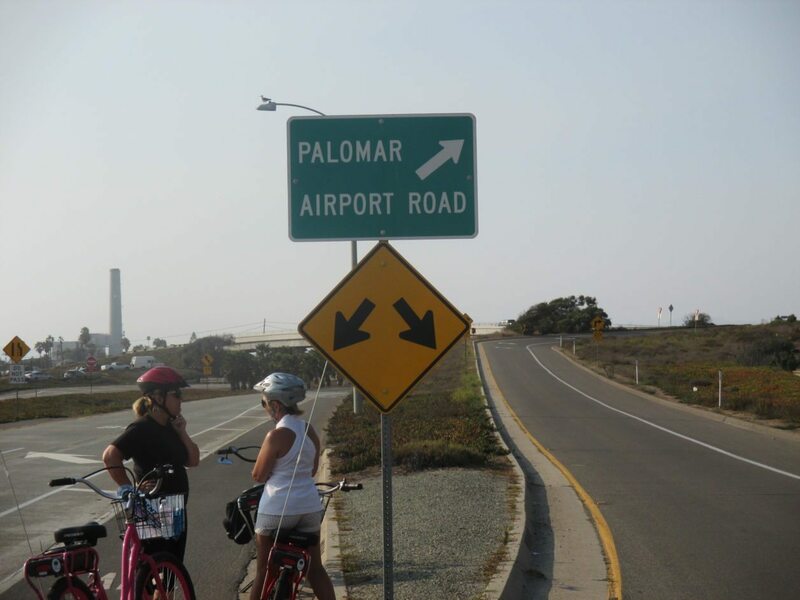 Continuing, riders will see a road sign for Cannon Road, and then Palomar Airport Road, but just continue straight and southbound on Carlsbad Blvd. 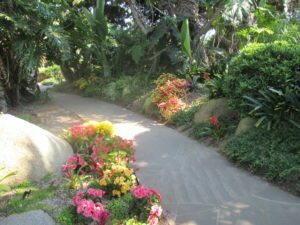 Just past Poinsettia Lane is a charming resort that I consider to be a hidden gem Cape Rey Resort. 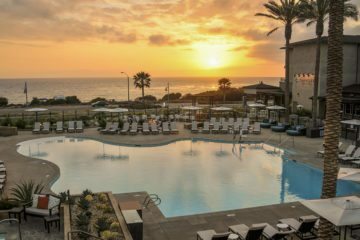 They have Chandler’s Restaurant & Bar, offering a delicious assortment of appetizers and entrees, with a lovely patio and offer drinks poolside. Check their web site for live music by the pool and during happy hours. 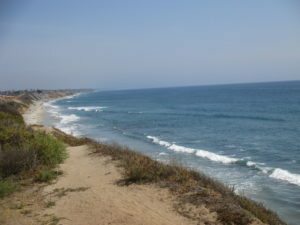 Further down the road, Encinitas City Beach and South Ponto Beach will be on the right and Baniquitos Lagoon is to the left. Just before the light for La Costa Ave. riders will see a parking lot and chain link fencing on the right. Just beyond this (toward the water) is a dirt pathway. 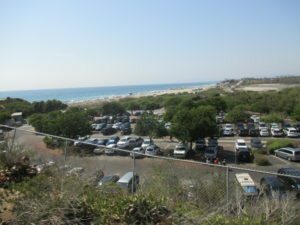 Riders can easily propel themselves up the hill to a lovely flat landing area with super 180 degree views of the ocean below. Great photo spot. 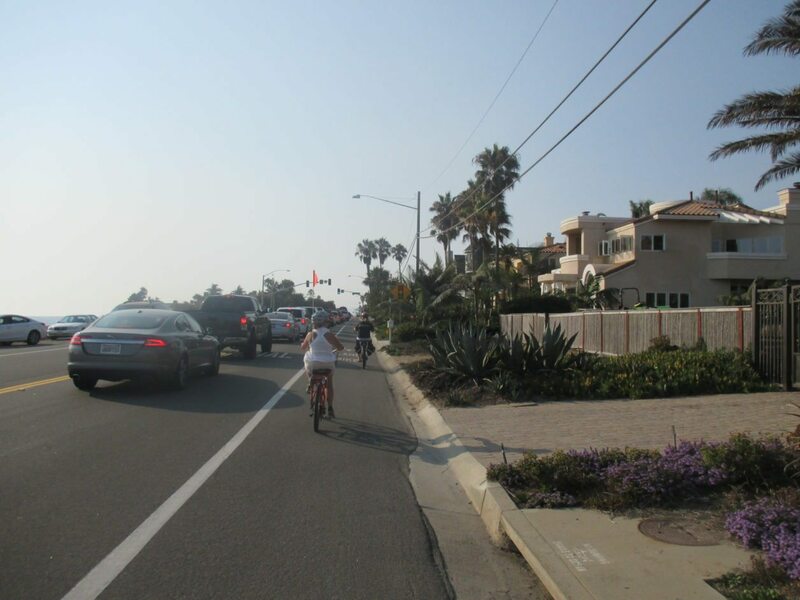 Returning back down the pathway, we make a right turn and continue along Carlsbad Blvd. Right about here is where we pick up the “Shared Road” which means that bicycles ride in the right lane of a regular two lane road. 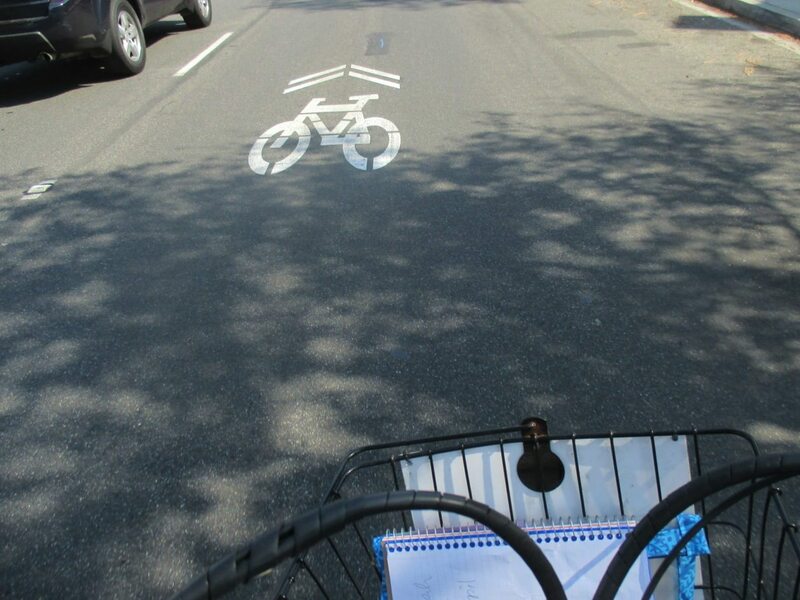 Cars are on the left, and you will know this because of the bike symbol which is painted on the road. As riders enter the north end of Encinitas there are lots of restaurants dotting the highway. 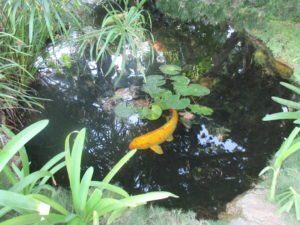 One of my favorites is Fish 101 restaurant. 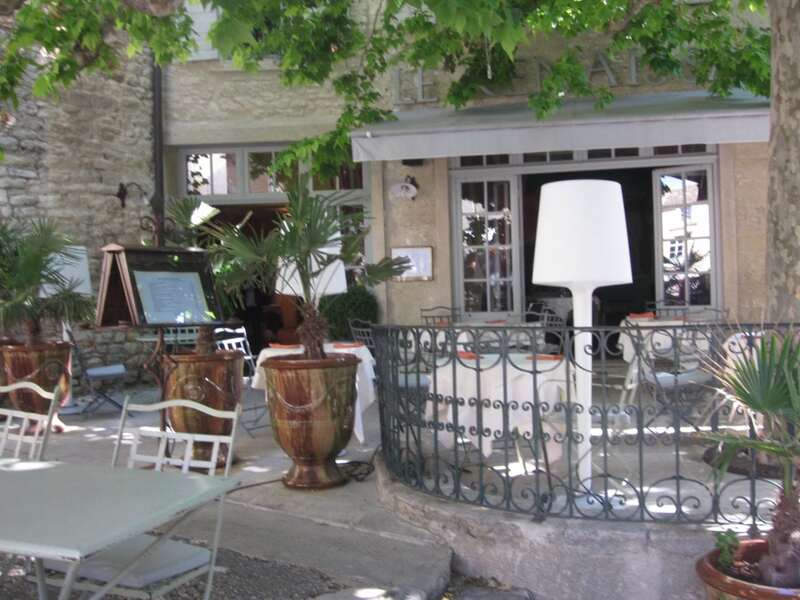 It is a small restaurant with the most amazing fresh fish around. They also source all of their produce from local farmers just a few miles away. 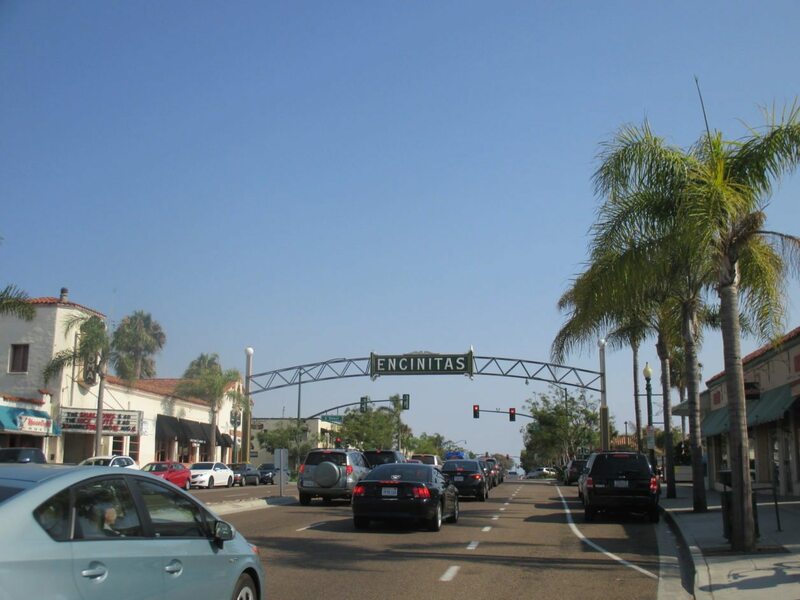 The archway of Encinitas greets rides as we enter the heart of downtown. 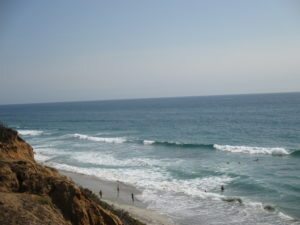 Just past Encinitas Blvd. the roadway is narrow, so we quickly take a right onto D Street, and then a left at Third Street. We follow this along (parallel with the ocean) amid a quiet tree-lined street of homes, cottages and tree houses. So there you have it. 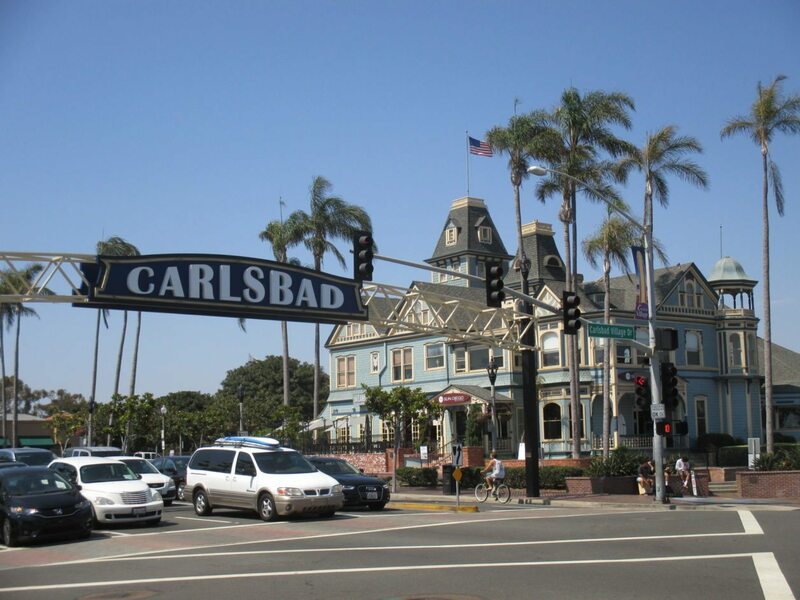 Carlsbad has so much to offer and there is nothing better than seeing all that behind the handle bars of a Pedego bike. With the wonderful scent of the sea and the wind in your hair, this is an instant vacation. Hello Fun! Pannikin Coffee & Tea– Built in 1888 the Pannikin is located in this historic Santa Fe Railroad Station on historic Coast Highway 101 which is now painted a bright yellow with white trim. 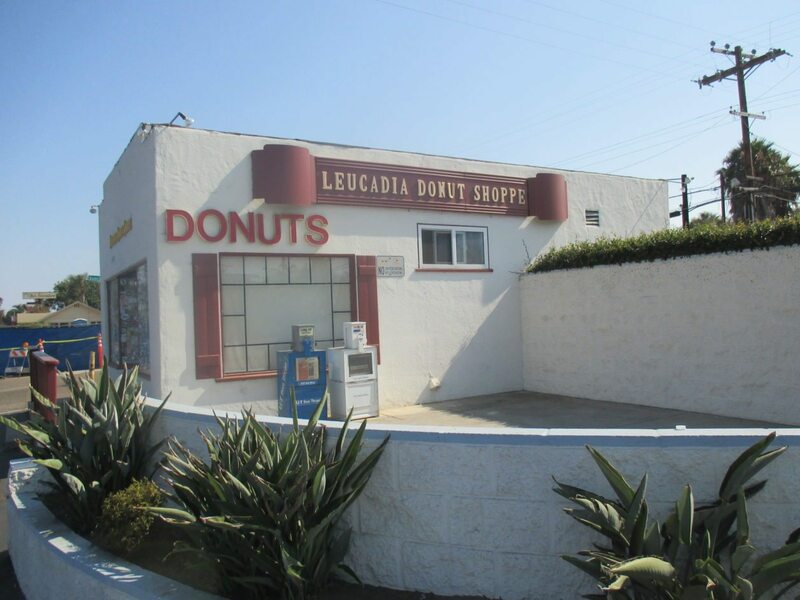 They are family owned and have been serving the community since 1968. 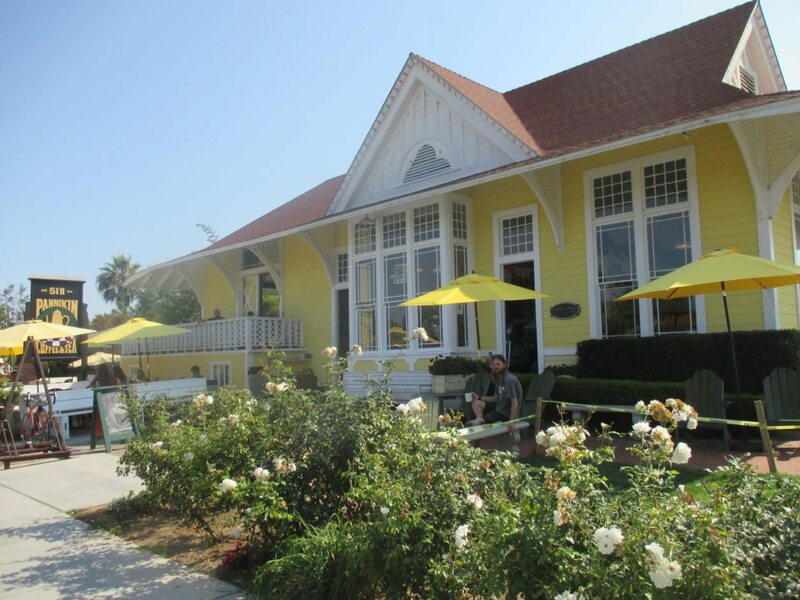 They roast coffee and yummy baked goods daily for all four of its San Diego locations. It is worth a quick stop. 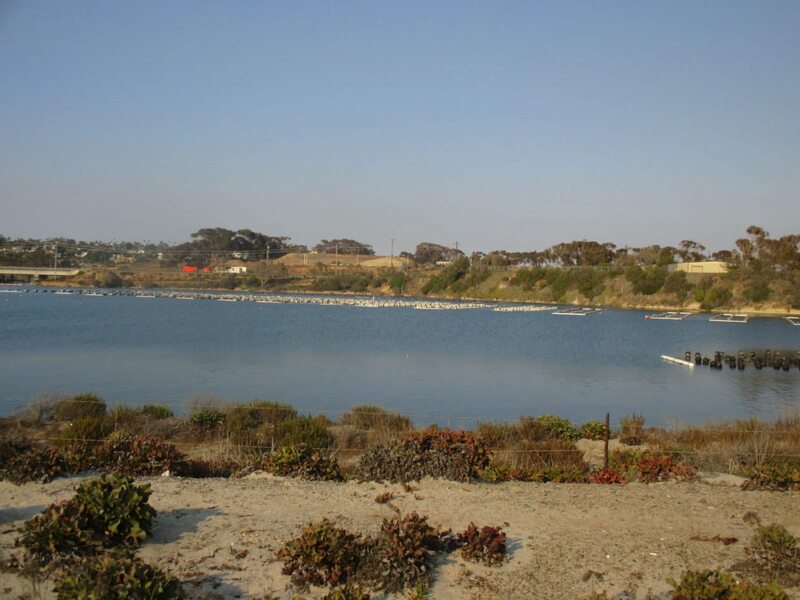 Carlsbad Aquafarm- Carlsbad Aquafarm cultivates Mediterranean Blue Mussels, Pacific Oysters and Ogo. 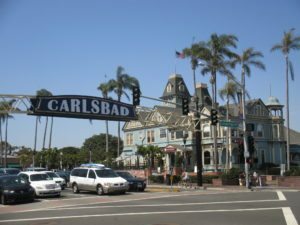 The company has been in operation since 1990 in Carlsbad. The farm has developed a secondary line of products for the marine aquaria trade known as “live-feed” that includes micro and macro algae, copepods, amphipods and brine shrimp. The farm uses sustainable suspended long-line cultivation methods that cause minimal impact on marine habitat, wild fish populations, water quality and the marine environment. Rigorous laboratory testing standards and ultra-violet purification systems help ensure product safety while close proximity to t LA and San Diego. This allows for a quick turn-around from harvest to delivery to wholesale clients in Southern California. The result is fresh, high quality products with a small carbon footprint. 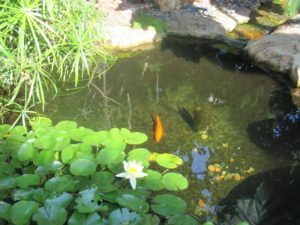 Carlsbad Aquafarm products are sold exclusively to wholesalers. 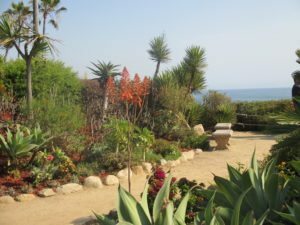 Dr. Seuss– I had no idea that Dr. Seuss lived in La Jolla and the unique shape of the trees gave him inspiration for his drawings. Self Realization Meditation Gardens- The internationally renowned gardens offer a diversity of colorful plants, meditation nooks and seating areas, koi ponds and small waterfall and spectacular ocean views – providing a unique inspirational setting where one can pray, study, meditate, or just sit quietly enjoying the expression of God’s beauty in nature. 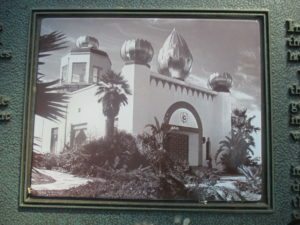 Shortly after Paramahansa Yogananda received the gift of the Encinitas Hermitage, he began plans for the construction of the Golden Lotus Temple, which he dedicated on January 2, 1938. The temple was designed by Paramahansaji himself with the intention of revealing as much as possible the panorama of nature’s beauty. 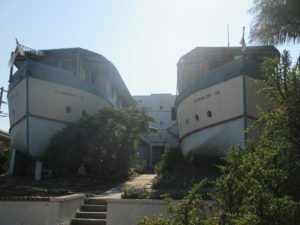 Magnificent views of sea and sky were afforded by the four-story glass observation tower and immense windows overlooking the Pacific Ocean, which was visible directly behind the low altar. 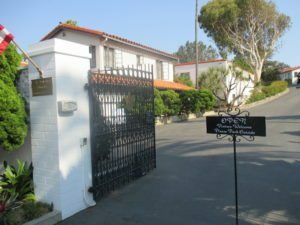 During the next four years, thousands attended the Thursday and Sunday services conducted by the Guru at this site (in the present-day Meditation Gardens). In 1942 the erosion of the shoreline caused the Golden Lotus Temple to become unstable, and sadly, it subsequently had to be removed. There is a plaque there today commemorating the site of this temple. Note: Pictures of the Temple are available on their web site. 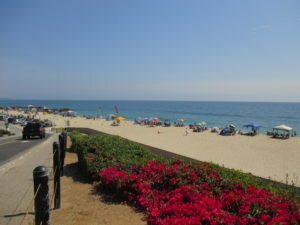 Couples Romantic Picnic- 3 hours for $79- Enjoy each other’s company while you soak up the sun, bike ride to the beach, and surround yourself with breathtaking sights. Pedego Carlsbad will provide the items needed to kick start your picnic so that guests can have the freedom to create their own getaway, including: two comfortable electric bikes with a basket, beach towels for relaxing by the sea, speakers to play both iPhones and MP3 devices, a keepsake cooler for complimentary bottled waters and deli sandwiches made by one of our local deli’s (selecting from a menu), and a keepsake Pedego sports watch to remember the day of fun. 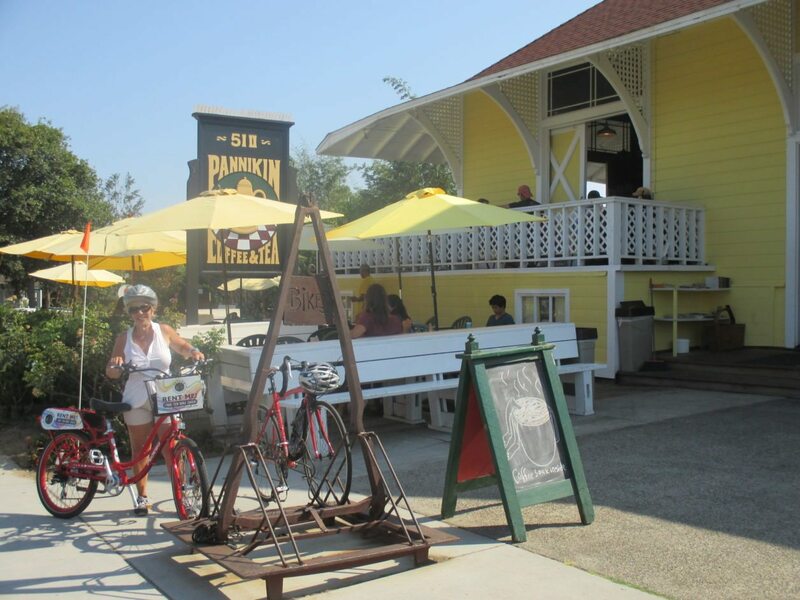 Guests pick up their Pedego bike between 10:00am and 2:00, and keep the bikes for up to 3 hours. They must be returned to the shop before 5:00pm. 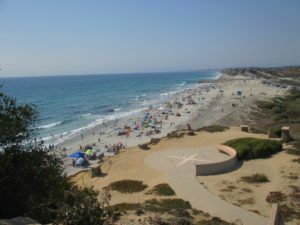 Lookout Tour 1.5 hours for $59- This tour lets riders see first-hand what makes Southern California special. 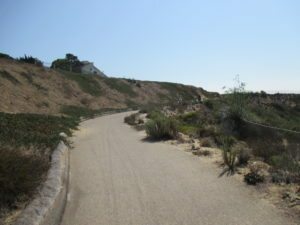 Ride alongside the historic Highway 101 where the highway hugs the Pacific Ocean. 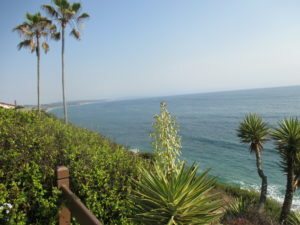 Enjoy a Look Out Point with commanding views of the Pacific ocean below. Great at sunset! BISTANGO “SPANISH NIGHTS” ON THE PATIO…EVERY WEDNESDAY…THRU SEPT!